If you want to work upon grading and color correction process, then DVR is the key tool for best results. Never to mention that it has included Fusion and the audio editing Fairlight after DVR 15. It allows users to work with multiple tricks for video editing such as transitions, trimming and waveform audio editing abilities. Simple OpenFX plug-in type support and you will soon be able to adjust all the video filters as per your need. This tool is widely used due to its automatic shot match and awesome color palette tool. On the other side, HitFilm Express is commonly used by various filmmakers as well as YouTubers. This advanced editing tool assists users to focus in visual effects with a collection of 140 plus options like procedural fire, explosion, blood spray, rain and shake etc. But the real value lies in its 3D and 2D composite tools that are far better than Adobe After Effects. Some of the key features are audio editing functions, chrome key feature, color grading and titling tools. The article below will help you to get more comparison information about these two video editor tools. Remember, we will discuss the free versions only, and the paid version, DaVinci Resolve Studio and HitFilm Pro has much more powerful features and the feature comparison will be more complicated. Part 1: What are the Differences between DaVinci Resolve and HitFilm Express? Part 2: Why Use HitFilm Express? Part 3: Why Use DaVinci Resolve? Part 4: Which One Should I Pick: DaVinci Resolve or HitFilm Express? If you want to have your video editing skills enter a new level, we recommend you trying Wondershare FilmoraPro. It provides both some basic editing features like trimming, splitting, rotating and combining, and advanced editing functions such as auto audio sync, keyframing, animaiton and advanced color tuning. There are various effects tools to make fabulous effects in FilmoraPro. What’s more, after finishing the editing, you can upload your video footage to YouTube and Vimeo directly. Download it now to have a try (Free). It works with 10.11 EI Capitan, 10.10 Yosemite and Mac OSX 10.9 Mavericks. Supports Windows 10, 8, 7 and Vista with 64 bit format. Compatible with Intel core i3 and higher versions. It has OpenGL 2.0 compatible hardware and offers 510 MB video memory. Supports Windows 10, 8, 7 64-bit version. Supports Linux CentOS 6.4 version. 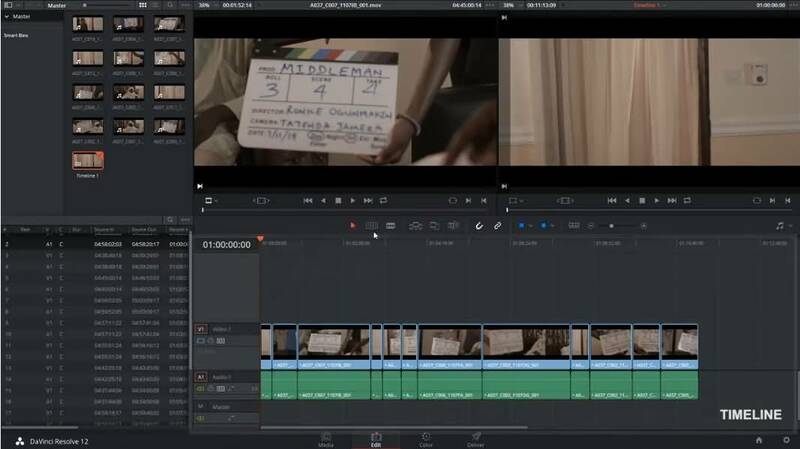 You will be glad to know that both HitFilm and DaVinci Resolve platforms have similar kind of interfaces. On DVR you will find four windows: Deliver, Color, Edit and Media whereas HitFilm possesses four windows as: Export, Edit, Project and Home. HitFilm is well known for its interactive platform with easy to access advance tools. On the left side of interface, you will see a media pane that can be used to import as well as manage all media files into folders. Edit history, effect controls etc can be managed easily. Timeline window is available in bottom right side that assists in loads of editing tasks with advanced visual effects. Its left hand side contains editing controls and right hand side shows meters for displaying audio volume levels. The top left portion has a trimmer that can easily cut down large video files. Finally the Preview window will help you to view the current frame on screen. If we talk about DaVinci Resolve then here edit page works like NLE software and a source as well as record monitor is available on top. A toolbar is also available to assist users in easy selection of editing tools. DVR Effects Library and Inspector will help you to apply unique controls over all clips. It can also work for time remapping and position scale rotation functions. DaVinci Resolve: It demands high performance systems with 4GB RAM and few file formats are not supported. HitFilm: You cannot access all features on free version. One need to make additional payment for Expressions, Advanced Text Editor and Multi Cam Editor. 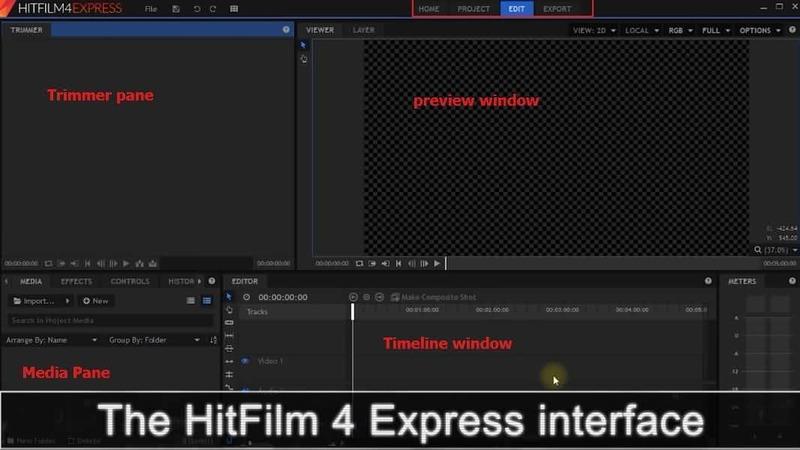 Part 2: Why users need to select HitFilm 4 Express? Free visual effects and editing software that not even poses any limit over editing task and not even ask for any subscription fee. It provides easy access to 3D compositing as well as to editing tasks. There are multiple tracking options with proxies etc. elements. Offers basic titling and motion design tools. Contains 140 plus 3D and 2D effects along with color grading and green screen removal abilities. The HF pro features along with after effect filters can help users to do customized editing. It is compatible with PC as well as MAC environment. Offers so many free tutorials for easy understanding, have dedicated customer support and community forum. It is designed to run perfectly on customer laptops. Editing timeline enhancements for workflow and playback controls. Contains lots of audio tools along balance, Doppler shift and audio reverse functions. Latest speed controls and animation features added. Hyperdrive: It can help users to develop star wars like hyperderive effect for Hollywood style filming. Action tools: Users can access built in gun effects as well as it is possible to customize 3D muzzle flashes even without wasting time on pre-rendering. Part 3: Why users need to select DaVinci Resolve 12.5? Resolve has so many interesting color correction tools and they make it industry standard tool with effective results. Some of the professional level features include scopes and XML etc. whereas in case of Resolve 12 version you can also avail new multicam tools. These tools make Resolve to stand best between its competitors like Premiere and Final Cut Pro etc. Blackmagic also possesses another important feature: Optical Flow. This feature helps editors to access workflows from multiple camera sources so that they can be edited fast. One can easily synchronize multiple cameras with manual controls via marked points as well as it is possible to access automatic controls using audio waveforms or timecodes. Part 4: Which one is Better: DaVinci Resolve or HitFilm Express? Both these tools are available for free and possess all interactive editing tools but still they results different outputs for different users. There is no doubt to say that Resolve is good for color correction functions whereas HitFilm leads to impressive visual effects. If you love numbers of effects like explosion etc then HitFilm is good for you. Those who want to work on color correction specifically can access resolve. For professional needs, Resolve 12.5 can be rated as best platform due to its awesome audio sync option as well as Optical Flow and XMLs. Note: The above comparison is suitable for DVR 12.5 and HitFilm 4 Express. Each of the manufactures will update the software often. Let me know if you want to know more differences between the latest versions in the comment below.